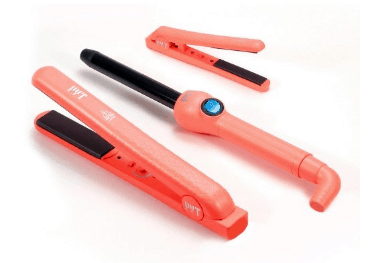 If you’ve been doing some heavy research on the best flat irons, you’ve surely come across some PYT flat iron reviews. This top selling flat iron has rave reviews for great reasons. There’s not much that this straightener can’t do. It features ceramic plates that leave your hair soft and shiny. I have been loving my Apalus brush hair straightener recently, but I have been impressed by the voluminous waves and tight spiral curls that this flattener can also deliver. You’ll love the voluminous waves and tight spiral curls that this flattener can also deliver. If you’re done with mediocre straighteners that don’t deliver, then this hair straightener is the one for you. Get ready to learn all that there is to know about the Pretty Young Thing straightener, or PYT straightener. You might think that the best way to get luscious curls is to a curling wand, well your wrong because the PYT ceramic flat can do this too. Want to know how? Follow these easy steps to get the curls of your dreams. Apply a light gel with a heat protector throughout your hair. Dry your hair completely. Any remaining moisture will prevent the curl from forming and staying. Gather a section of hair that measures between one and two inches. Clamp down and turn the straightener one and a half turns. Make sure to go in the direction that you want your curl to go. 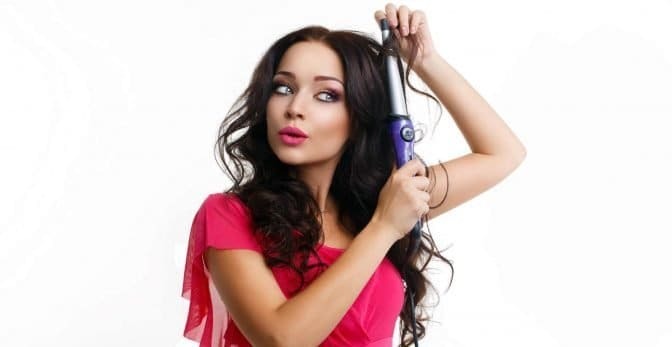 While maintaining tension on the curl, pull the flat iron through the entire strand of hair. Repeat until the desired look is achieved. Spray with hairspray if desired. If you’re looking for a styling tool that can do it all, this is it. 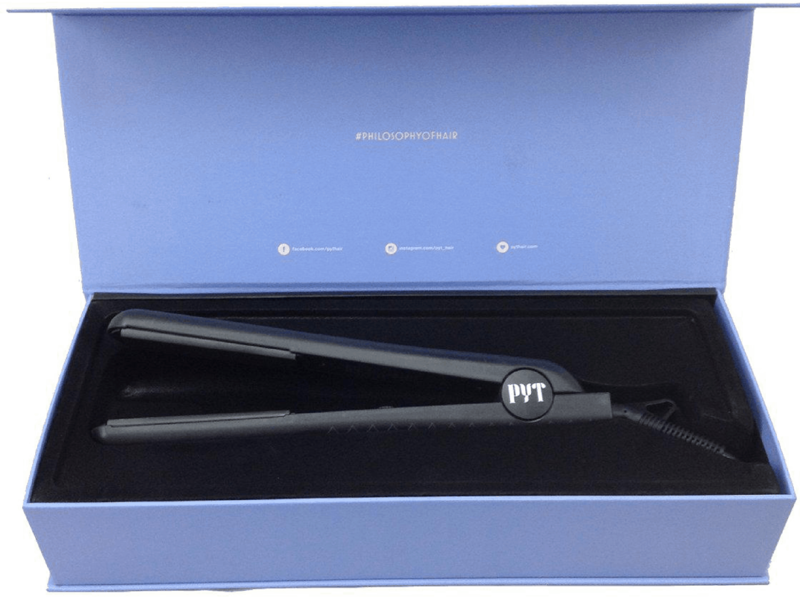 The PYT ceramic flat iron can give you smooth, sleek, straight hair or tight, spiral curls. Need something in between? Voluminous waves can be achieved with this styling tool as well. The temperature can be adjusted anywhere from 140 degrees Fahrenheit to 450 degrees Fahrenheit. This will allow you to find the perfect temperature for your type of hair and the look that you’re after without causing any damage. With titanium plates and an attractive slim design, PYT Titanium Stylers are perfect for creating voluminous curls or perfectly straight hair. I love working with titanium plates because they produce consistent heat for fast results. They’re also great for keeping hair conditioned and shiny because they use infrared heat. The plates float so I never experienced a crease in my hairstyle. If you’re looking for a high-quality straightener that won’t break the bank, the PYT Titanium Styler is perfect for everyday use. Tourmaline is a secret weapon in the world of hair straighteners. It’s a crystal that has been ground into a fine powder and then infused into the plates. When heated, your hair becomes saturated in negative ions. This leads to a faster straightening process and protects your hair more than the majority of flat irons. This flat iron is my go-to styler for nights that I want to feel a bit more pampered. I always use it when I have a special event, like a wedding or family party. It seems to give my hair an extra boost of shine and gives me the exact look I’m after, whether it’s straight or curly hair. This flat iron might cost a bit more but it’s absolutely worth it. If you change your mind and styling tools at a fast pace, the Lola Styling Tool Kit could be just what you need to keep up. It includes the Ceramic Styling Tool, the 19mm Clip Free Curling Wand and the Mini Ceramic Styling Tool. 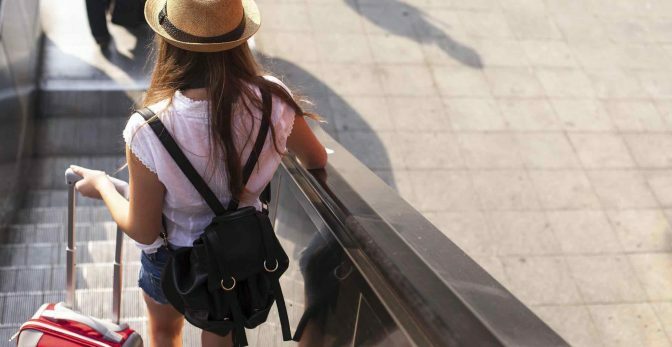 This is the perfect kit for anyone who travels and I take it with me on every trip I go on. Since you’re getting three stylers, you can’t beat the price and the kit comes with a 1-year warranty. If you’re having a hard time deciding between PYT products, consider this kit to satisfy all of your needs. 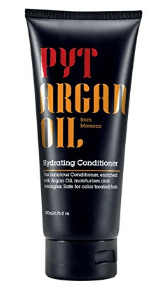 One of my favorite benefits of working with PYT stylers is that the company offers their own products as well, which all work together to keep my hair healthy and looking fabulous. Their shampoo is enriched with argan oil so it leaves my hair clean and nourished. And for those of you who color treat your hair, it’s safe for you as well. I also love that their shampoo has vitamin E for moisturizing and plenty of fatty acids that are natural and improve elasticity (this prevents split ends!). PYD Conditioner is probably one of my favorite conditioners of all time. I loved how my hair smelled after using it and I never struggled with difficult tangles or knots. It left my hair feeling healthy and nourished and it seemed like all of my split ends disappeared overnight. I highly recommend letting this conditioner sit in your hair for a few minutes before rinsing it out to get the most out of it. I love how using an oil treatment makes me feel like I’m living a life of luxury. 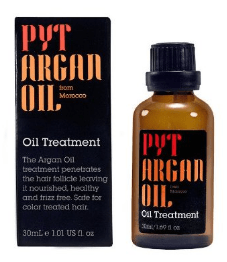 PYT Argan Oil Hair Treatment is one of my favorites. It doesn’t leave behind an oily residue like other brands do and I can instantly see a difference in my hair. 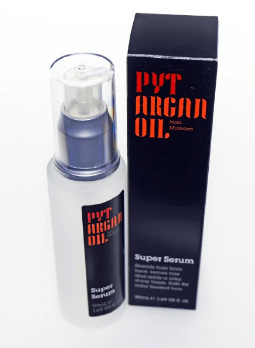 This oil works for people with thin hair who want to protect it from split ends and damage and it works for those with thick, coarse hair who need a little help keeping their hair smooth and silky. No matter your hair type, you’ll love what this oil treatment does for you. I can’t stress enough how important it is to prep and protect your hair before using any type of heat on it. This serum will protect your hair from harsh heat while taming frizz and leaves behind a silky finish that you’ll love. Don’t let the price scare you. A little goes a long way and the protection is well worth the cost. I’ve used less expensive serums in the past and this is the type of product that only works as well as its included ingredients can. In other words, you get what you pay for. 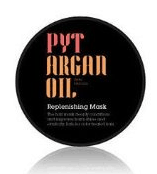 PYT loves their argan oil and this is another product that takes advantage of everything this natural oil has to offer. I use this hair mask about once a week as an extra conditioning treatment and it really makes a difference. My hair is instantly smoother and silkier. Even if your hair is color treated or fine, you’ll love the results from this hair mask. A little goes a long way with this mask so the price is actually an incredible deal. 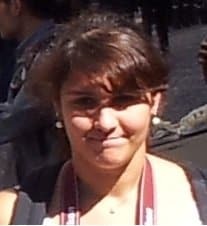 Depending on the length of your hair, the container can last you several months. This is probably my favorite PYT product. It features natural holding agents derived from rice. You can spray it on wet hair for volume or dry hair for hold. I promise, once you try this spray, you’ll be hooked for life. Unfortunately, no flat iron is perfect. 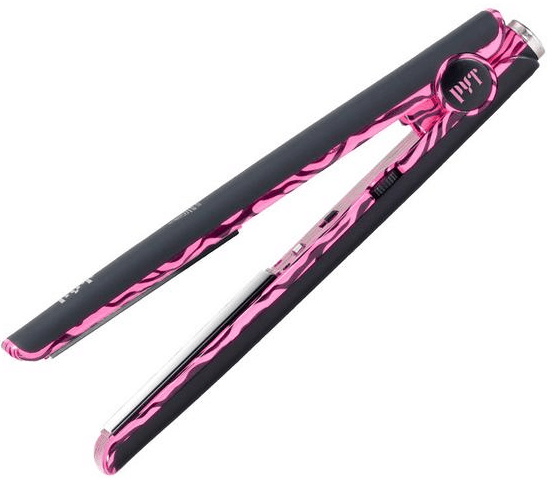 While the PYT flat iron is about as close to perfect as you can get, every design has a flaw or two. If you want to be completely informed about the flat iron, here’s a list of pros and cons to compare. Chi has been a champion in the flat iron market for years but the name’s popularity doesn’t mean that the products are necessarily the best for your needs. Chi became popular in the early 2000s, thanks to its high-quality ceramic plates. However, there is newer technology on the market now and PYT is one of the leading names that’s catching plenty of attention. While Chi features a wide variety of stylers, some of them don’t hit the 400-degree mark, making them nearly useless for people with thick, curly hair. If you do purchase one that reaches a higher temperature, there’s a good chance that you’re overpaying for the same perks available by a competitor for much less. One of my favorite features of PYT is that they utilize negative ion technology. This means that your hair will remain nourished and healthy, even if you use your straightener every day. I’ve been very happy with Chi flat irons in the past but if you’re looking for the best compromise between style, performance, safety and cost, I believe the PYT is ahead of Chi in all of these categories. Want to use your PYT hair straightener to straighten your hair? Here’s a quick tutorial that will have you straightening your hair like a pro in no time. Apply a styling cream to damp hair after showering. If your hair is very thick, a straightening balm could help. Finish by coating your hair with a heat-protective spray. Dry hair thoroughly. This is a crucial step because using your flat iron on damp hair can damage your locks and cause split ends. Start with the bottom layer of your hair. Section hair into small sections. If you find that you need to run the flat iron over a section more than once during the straightening process, the section is too large. Clamp the flat iron down onto a section of hair, placing it as close to the scalp as possible. Slowly pull the flat iron over the section of hair, keeping tension as you go. The movement should still be smooth though so don’t clamp down too tightly. Once you’ve finished with the bottom layer of your hair, move to the next until you reach the top layer of your hair. To finish, rub a serum gloss over the top layer of your hair for a boost of shininess and to hold stray hairs in place. If your hair tends to get frizzy, finish with a little spray of hairspray. Your PYT flat iron comes with an amazing warranty that really sets this product apart from the rest. If your flat iron won’t hold heat, reach certain temperatures or becomes unusable, you can order a replacement as long as you have an active warranty. You will receive a free first-year warranty with your purchase. There are two types of warranties available once your free first-year warranty expires. You can purchase an extended two-year warranty or for just a bit more, a lifetime warranty. If the terrible day comes where you need to replace your flat iron, simply send the following items to the address listed on your warranty. Contact Details: Send your full name, email address, phone number and shipping address. Keep in mind that a P.O. box will not accept shipments so you might need to use a different address than what your normal mail is sent to. Damaged Flat Iron: You must send the damaged styling tool for a new one. If you have the original box, send it in that. Otherwise, wrap it safely for travel. Shipping and Handling: This is not covered by your warranty. Send a check or money order to cover the shipping costs. Contact your warranty provider to get the current shipping and handling price. Proof of Warranty: To validate your warranty send a photocopy of your warranty. To validate the free first-year warranty, a photocopy of the original receipt is needed. Within a week, you should have your new PYT flat iron. It’s that easy! The world of flat irons can be confusing at times. But once you’ve given the PYT flat iron a chance, you’ll be blown away at the results. No other flat iron can compete with the quality, results, price and guarantees that this flat iron presents. Don’t waste another day wishing that you could get the hairstyle of your dreams. Dreams come true with a PYT hair straightener.